You're always learning when you have a little one - bathing, weaning, sleep routines, teething - and toys are just another area you need to become familiar with when you become mum. I remember in the early days looking forward to when I could give Ethan books and balls and small figures to play with. The idea that he would interact with the world was such an amazing concept and now, here we are. Ethan is at the stage where he seems to be talking and playing games with himself, lost in his own world - one that we are invited to enjoy by reading a book to him or rolling a ball in his direction. As I type this, he's rolling a football and bouncing it, catching it himself and them picking it up to pass to me. 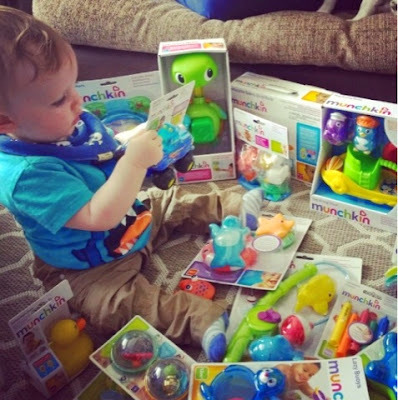 It's a lot of fun to see him develop right in front of our eyes and we can't help but get excited about all the new toys and games we can enjoy with him as he gets older. We went shopping a couple of days ago to buy Ethan a few new toys. He seems to be at an inbetween stage as although he has lots of toys, he's getting a bit too old for some whilst not being quite ready for others. Looking around the toy shops, it was hard to find something new that would suit Ethan's current stage so I thought it would be helpful to share some of his favourite toys so far in case you're wondering what to buy your almost-toddler. Ethan is a bookworm in the making. Without fail, every time he's playing in the lounge, he'll crawl over to the shelf and will pull out all of his books we keep downstairs. 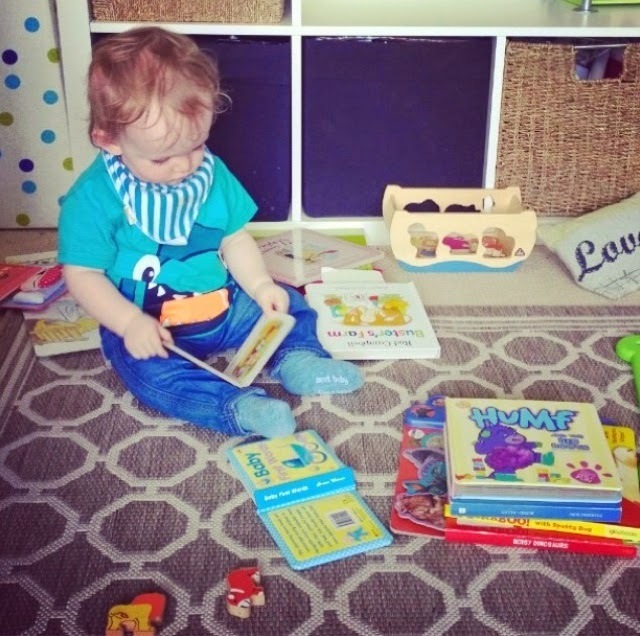 He has a small Winnie the Pooh book which is his absolute favourite but he also really enjoys the Mr Men collection we bought him for Christmas. I think that he enjoys the fact he can ask us to do something and we'll respond. A good selection of stories in a durable board format will be sure to spark your little one's imagination, help them learn and encourage good habits as they get older. 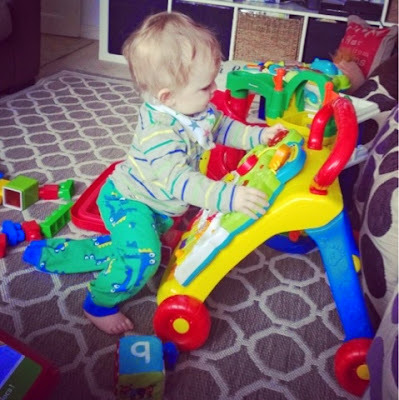 Ethan loved his Jumperoo no-end from the age of 6 months but as he progressed towards standing, it was time to move on. We recently chose a ride-on zebra, again from Fisher-Price, which plays music and bounces and spins. Ethan is showing more interest in it and we hope it'll help his confidence and develop his leg strength as he begins to learn how to walk. Ethan had two Little People in a garage toy set we bought him for his birthday but he quickly lost one when we went away. We tried to buy a few more for him to play with as he really loved them and would try to make them walk, but we were disappointed that other ones in this range only seem to come in pairs or as part of a bigger toy set. Never fear, Mothercare to the rescue! They sell a range called Happyland and it was just what we were looking for. We chose a fold out playmat that has certain points which are activated by toy cars when they roll over them and you can buy lots of different people and animal figures and vehicles, plus mini buildings like a police station and a school to increase the playing potential. Ethan loved the set as soon as he saw it and it was great to see him playing by himself with the cars and the people. Almost anything can be a toy when your little ones are little, that's one thing I've learnt from nursery. Bottles filled with stones or glitter water are fascinating and sometimes the simplest toys are the best. Ethan has a box of Mega Blocks, different sized balls and what seems like hundreds of cuddly toys, but he does use them all in his own time. Variety is key! Ethan loves bath time and he never bathes without some friends in tow. 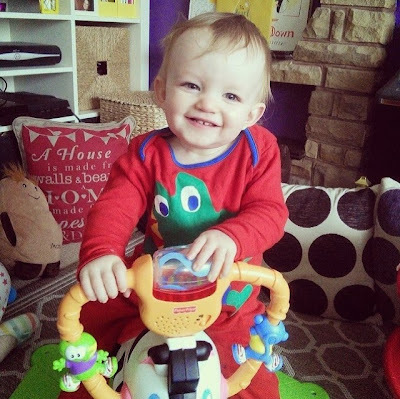 He has a range of rubber toys including a family of ducks and different sea creatures and now, thanks to the lovely people at Munchkin, he has enough toys to play with until he's too big (like his Dad) to fit in the bath! I won their BritMums Live competition and now, Ethan has stacking cups, squirting turtles, spinning balls, stacking toys, hoop shooting games... you name it! I'll share more about these soon but I can't recommend them enough if you want to make bath time lots of fun. We have two Ikea Expedit bookcases in our lounge, one large and one small, and a few of the slots are filled with baskets of Ethan's various toys. We keep larger items on top of the bigger bookcase when they're not being used and our spare room upstairs has the same bookcase to give everything a place and to keep everything organised. It really helps us - otherwise, we'd be swamped! Different toys live in different places in our house. We even have certain ones in a basket in the car, so we always have something for Ethan to play with when we are out and about. We do this so Ethan can enjoy different toys at different times, and throughout the day, we rotate the things he plays with. He always has his books close to hand but for his bigger toys, such as his walker, ball pit or box of blocks, we try to bring these out every so often so he always has something new to try and hopefully doesn't get bored of anything too soon. As I finish this post he's still playing with his football, so it seems he's not getting too bored of his things just yet! 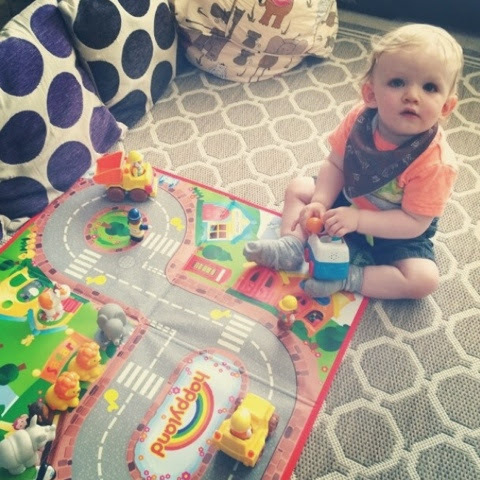 What toys does your little one enjoy the most? Do you have any suggestions or ideas to share?